HILTON Petaling Jaya’s Genji Japanese Restaurant draws inspiration from Japan, Boston, Australia, Malaysia, India, and Korea for its International Makimono promotion this month. 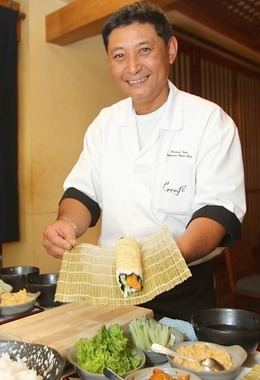 Genji master chef Richard Teoh and his team have included Asian and Western cuisine elements to offer diners a variety of makimono, also known as sushi roll. 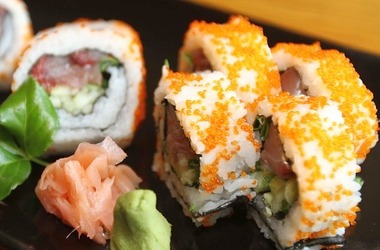 From the land down under is the Reverse Roll with Australian King fish and Flying Fish Roe. The master at work:Teoh at a sushi making lesson. The Japan Sushi Roll boasts a delightful combination of chopped tuna belly, spring onion and bell peppers. It was refreshing and minty, thanks to the Japanese Oba leaf in the sushi. Next, we had the Sushi Roll with Boston Lobster Glazed with Teriyaki Sauce, served with lobster miso. We also sampled the Malaysian sushi — Chicken Rendang Roll with Vegetables and Chilli Padi for some localised flavour. Inspired by the land of morning calm was the Kimchi Roll with Spicy Chicken, Lettuce and Cucumber. 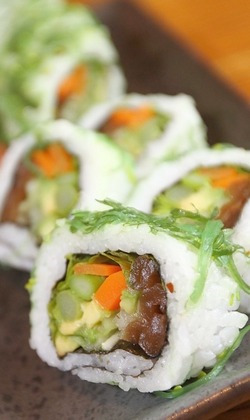 Sushi for vegetarians are on offer too — the India Sushi Roll with Assorted Vegetables, served with vegetarian soy sauce. All sushi are served with wasabi and pickled ginger. Vegetarian delight: Vegetarian Roll with Assorted Vegetables, served with wasabi, pickled ginger and vegetarian soy sauce. The sushi rolls are available for lunch (12.00pm-2.30pm) and dinner (6.30pm-10.30pm).